A map released by the U.S. Centers for Disease Control shows which cause of death is significantly higher than national average in each state. All places across the United States have the same leading causes of death: heart disease, cancer, stroke, and diabetes. But some states are more likely than others to harbor certain risks. For example, death from "accidental discharge of firearms" is most likely in Alabama and Tennessee. Inflammatory diseases of female pelvic organs is the distinctive cause of death in New York, while hyperplasia (enlargement) of the prostate is distinctive to California. Florida has the highiest risk for HIV, Texas for tuberculosis, and Louisiana for syphilis. 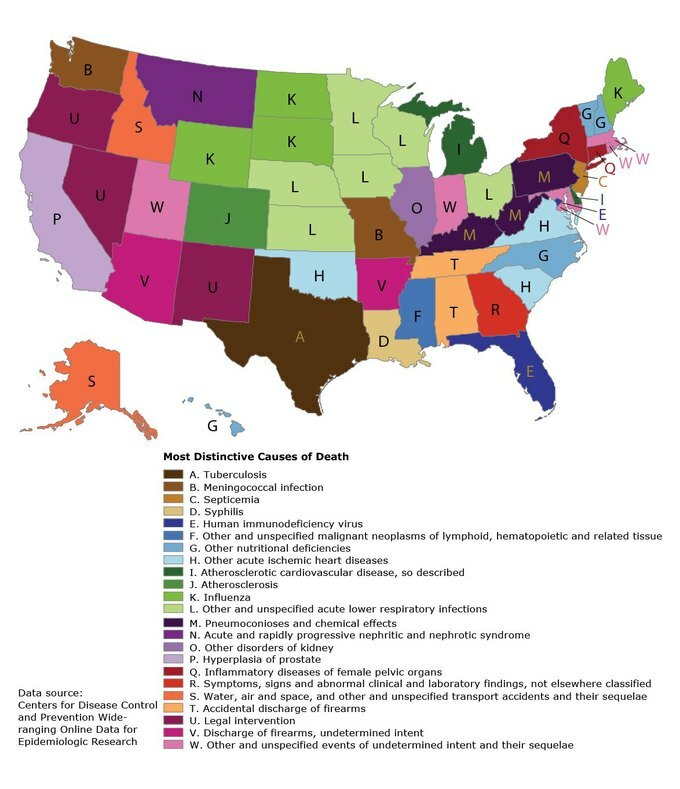 The Centers for Disease Control admit that the map does have some limitations and is certainly not representative of the most common deaths in each state. And yet, it's quite informative.